Origin and Habitat: San Luis Potosi, Mexico. 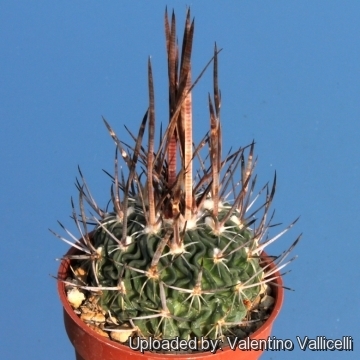 Description: The so called "grandicornis" is a solitary (or rarely branching) plant, considered by many only one of the many forms of Stenocactus crispatus. 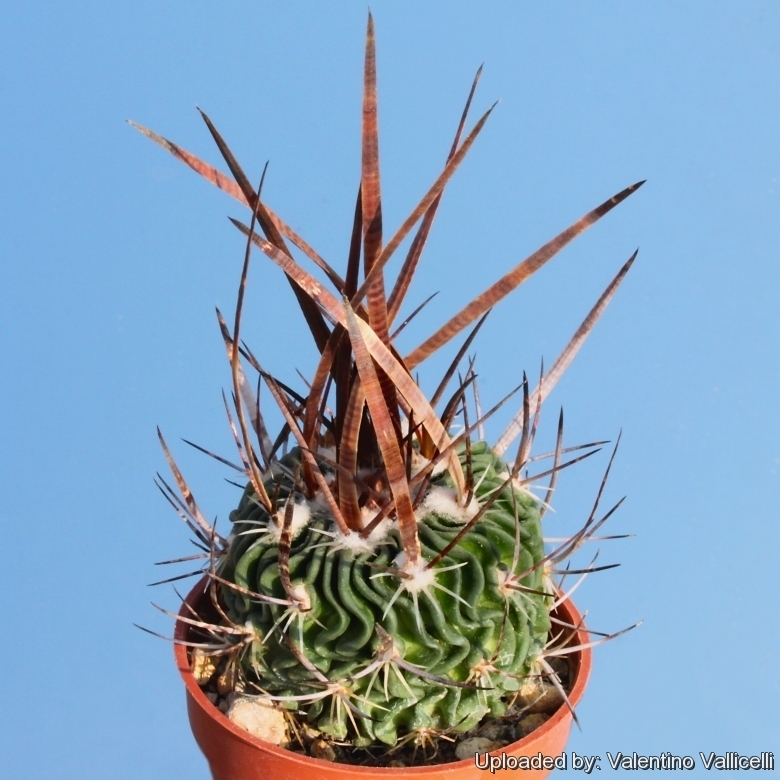 It is characterized by particularly long central spines and wavy ribs. The plant found in cultivation are quite variable, and the dissimilarity among seedlings spination may be considerable. Stem: Up to 20 cm tall, 10 cm wide, globose, short-cylindric or obovoid, somewhat depressed at apex, light green to olive-green. Ribs: 30-60, thin with very regularly and attractively waived, depressed in the region of areoles. 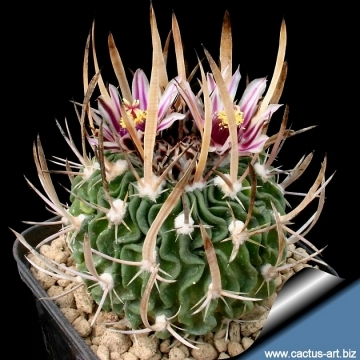 The flattened, wavy or curled ridged of this species are characteristic of other kinds of Echinofossulocactus. Areoles: 1 to 3 in each ribs, woolly in youth, later naked. 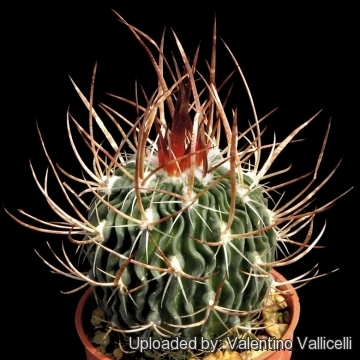 Radial spines: Usually 4 to 6 flattened, whitish to brownish, 0,5 to 1 cm long and about 0,6-1 mm wide at the base. 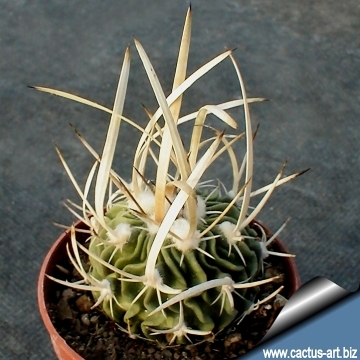 Central spine: 3-4 very flattened, whitish, yellowish, brownish to almost black, often darker at the tip, directed upwards ± rigid, ferocious-looking, straight or curved, unequal with one very long up to 10 cm long and 1-5 mm wide at the base. Flowers: Central, funnel-shaped rather small, perianth segments in two series, pale pink with a purplish midrib, oblong-linear, acute. 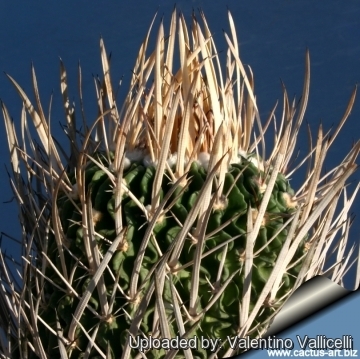 Flower tube covered with imbricated scales. Blooming season: Late spring to summer. Fruits: 8-12 mm long, 4-6 mm wide, obovoid reddish to greysh, dry at maturity. Seeds: 1 mm long x 0,9 mm wide, pyriform to reniform, black. Head with celled and wavy wall. 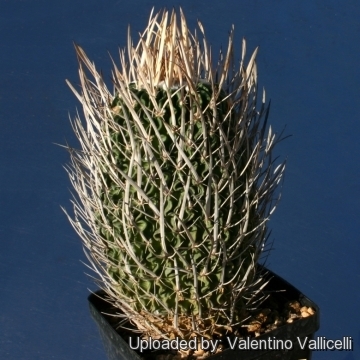 Cultivation and Propagation: Stenocactus grandicornis is easy to to care cactus, recommended for any collection that needs lots of light with ample airflow.